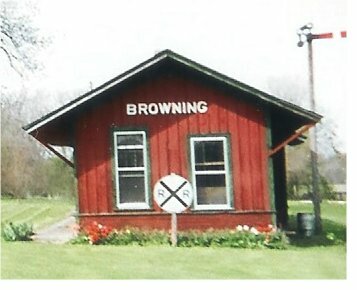 We are fairly certain that Browning residents began a school system for their children by the late 1800s. By the early 1900s the town's population had reached 455 residents and definitely had a school building in place. Browning supported its own high school through at least the 1947. Frank Caldwell tells us the Browning High School building was constructed in 1915. "Browning High School closed it's doors in May of 1947. Browning had been a three-year high school and those that graduated in 1947 had the option of going on to Rushville for a 4 year diploma. In the fall of 47 Browning joined the Schuyler Community Unit Dist. #1 with the high school then in Rushville and Browning now being a grade school with classes 1 thru 8. In or about 1958 a kindergarten was added." Browning High School was annexed into the Rushville School District. A K-8 facility remained at the high school building for several years after the merger. School Fight Song: "Go Browning Bears"
To the tune of "On Wisconsin"
Go and fight fight fight! For a basket is in sight! We’ll stand behind you, Whatever may be tide! We are certain the Browning boys competed in basketball. It s probable that baseball and track were offered as well. School team records and coach's names are among the items we are seeking at this time. According to the IHSA website (www.ihsa.org) the Browning High School boys basketball program won two District titles during their existence. The titles came in the mid-1940s. Unfortunately the team records and the coach's names of these teams are not available at this time. Scores involving Browning High School in the IHSA State Tournament were located on a website titled "Illinois Postseason Basketball Scores." These scores are listed below as well. 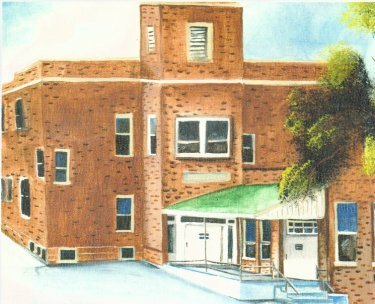 **Final basketball game for Browning High School, merged with Rushville in the summer of 1947. Browning Grade School 7th Grade Boys Place 2nd in 1993 State Tournament! "In 1993, the Browning Bobcats 7th grade boys basketball team finished 2nd in the 1A state basketball tournament (http://www.iesa.org/activities/bbk/index.asp). To this day, the 1993 Browning Grade School team has the smallest total enrollment (27) of any team to ever play for a state title in Illinois (no link for this, but a primary source exists in the form of a 1993 issue of the Peoria Journal Star). The school shut down for good in 1994 due to a lack of enrollment and funding. Students from Browning today attend school in nearby Rushville." "I was a Browning Bobcat from Kindergarten-Eighth grade (1971-79). There was no High School at that time. It was an awesome school!! It was a wonderful country school. It had the best teeter totters in the world and the tallest slide I'd ever seen. The younger chilren played in the front of the building and the older ones had a choice of the front or the back. I loved it and have enjoyed my trip down memory lane"